February 4, 2018 by Sandra 0 comments on "Best Children’s Raincoats With Matching Boots And Umbrellas – Reviews"
With fall just around the corner, you may have begun your search for a new raincoat with matching boots and an umbrella to protect your child from the elements when they get caught in the rain or are out splashing in those puddles. There are many styles of children’s raincoats with matching boots and umbrellas to choose from. On this page you will find a selection of rain wear sets that are suitable for boys and girls from brands like Western Chief, Hatley and Kidorable which are some of my favorites. 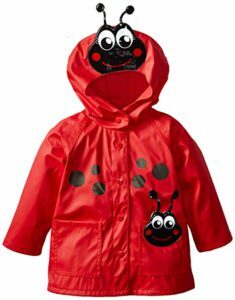 This Ladybug rain coat for toddlers and little kids has a waterproof outer shell and moisture-absorbent lining. The outer shell is 100 percent polyurethane and the lining is 65 percent polyester and 35 percent cotton for a comfortable fit on damp and rainy days. An attached hood and snap closures down the front of the raincoat, ensure that the rain will stay out and kiddos will be kept dry during outdoor play. This raincoat is absolutely adorable on and will make your little ladybug FAN very happy. This ladybug raincoat does come with matching ladybug boots. 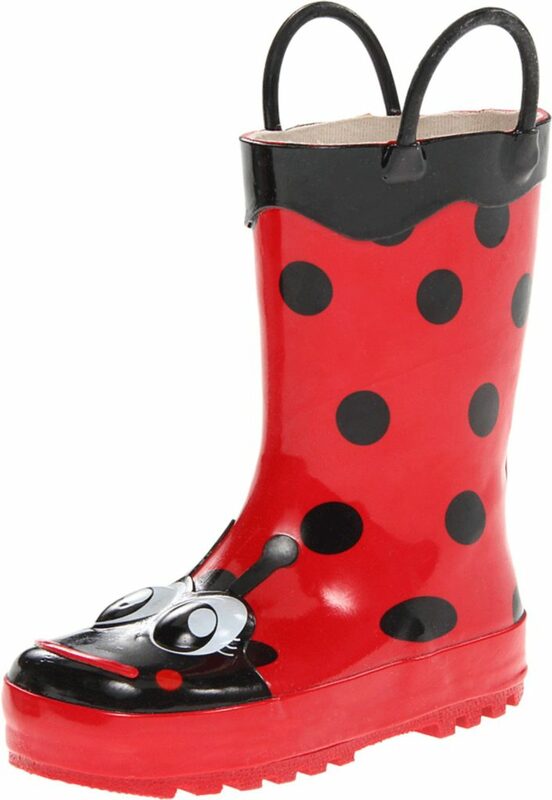 These ladybug rain boots feature a waterproof rubber upper with a FUN bright ladybug print to brighten up anyone’s day! A plush cushioned foot bed provides comfort for all day play while a moisture-absorbent lining keeps little feet warm. Two pull handles makes it easy for young children to put their boots on and take them off all by themselves! The rubber outsole is lightly treaded and easy to keep clean and these boots have a removable EVA insole. 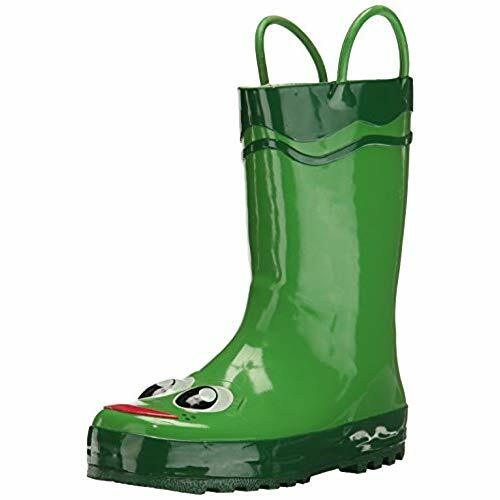 These rain boots can be worn not only for rainy days, but for any other activities like field trips, camping, a day at the beach or even for dress-up play. 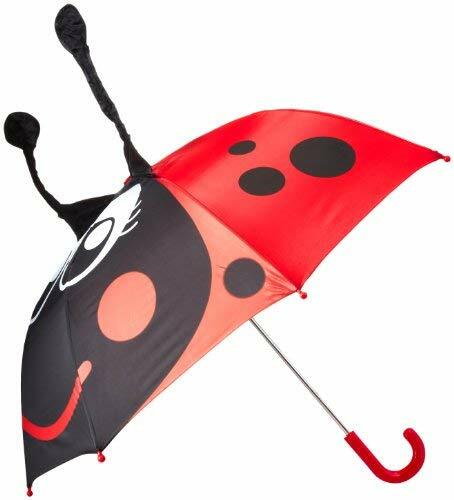 To go with this cute ladybug rain coat and matching boots, why not get the umbrella for a complete set. 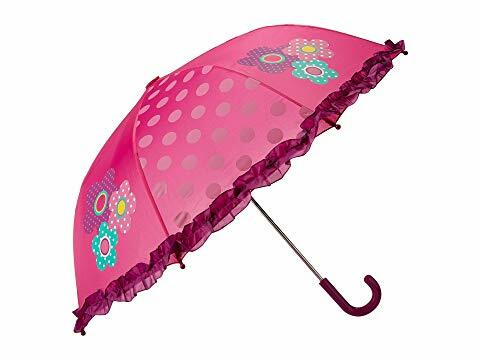 This Western Chief umbrella in ‘Lucy the Ladybug‘ is perfectly sized to make it easy for little ones to open and close this umbrella on their own. This nylon umbrella is very durable and is sure to keep your little one dry on rainy days. This umbrella is made from polyester and has a plastic inner frame and handle. This umbrella is SO cute and will go perfect with the matching rain coat and boots. This Western Chief rain jacket features a waterproof outer shell plus a moisture absorbent lining that is a combination of polyester and cotton. This rain coat is breathable so kids can enjoy all kinds of play outside while staying warm. This rain coat has an attached hood with snap closures down the front of the jacket to ensure that the rain will stay out. 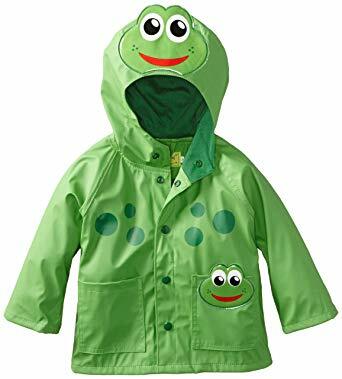 This froggy rain coat also has two pockets on the front of the jacket. This rain coat is adorable and has a lot of detail to it. It is also very durable in construction. This rain coat comes with matching boots. These Western Chief waterproof rain boots are made from a natural rubbers which is flexible, durable and waterproof. These boots are lined with a soft, polyester/cotton blend lining to give comfort and absorb moisture. They also are designed with a cozy EVA insole. which is removable, making them easy to replace and clean. These rain boots also feature a slip-resistant lightweight treaded outsole that provides good traction on wet surfaces. They also feature easy pull on handles which makes it easy for children to put their boots on and take them off all by themselves! These boots are so CUTE but they are also very durable and comfortable to wear for kids. This rainwear set also comes with a matching umbrella. 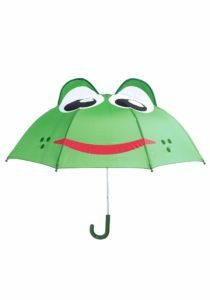 This Western Chief Kids Character Umbrella in ‘Fritz the Frog‘ features a fold closure with a plastic inner frame and handle. This nylon umbrella is perfectly sized to make it easy for little hands to open and close this umbrella on their own. Lots of colors and styles to choose from. 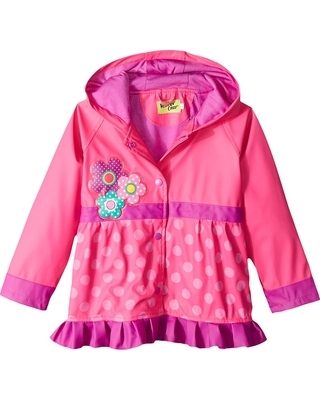 This flower cutie rain coat for girls features a floral applique with polka dot design. It has a warm jersey and polyester lining with a front snap closure. The materials that this raincoat are made out of are breathable which allows kids to play outside while staying comfortable. The hood is fixed and it has a water-resistant and breathable PU fabrication. The hemline is ruffled. This rain coat comes with matching boots and an umbrella. These rain boots for toddlers, little and big kids are constructed from an all natural rubber and are covered with butterfly and floral decals. Two handles on the sides of the boots makes it easy for kids to pull them on and off all by themselves. They are also designed with a moisture-absorbant cotton lining along with a lightly treaded rubber outsole to keep her safe on her feet. These boots are very cute, comfortable and easy for little ones to get on and off according to parent reviews. Your child will LOVE them. Why not get the umbrella that goes with the raincoat and matching boots for a complete rainwear set. 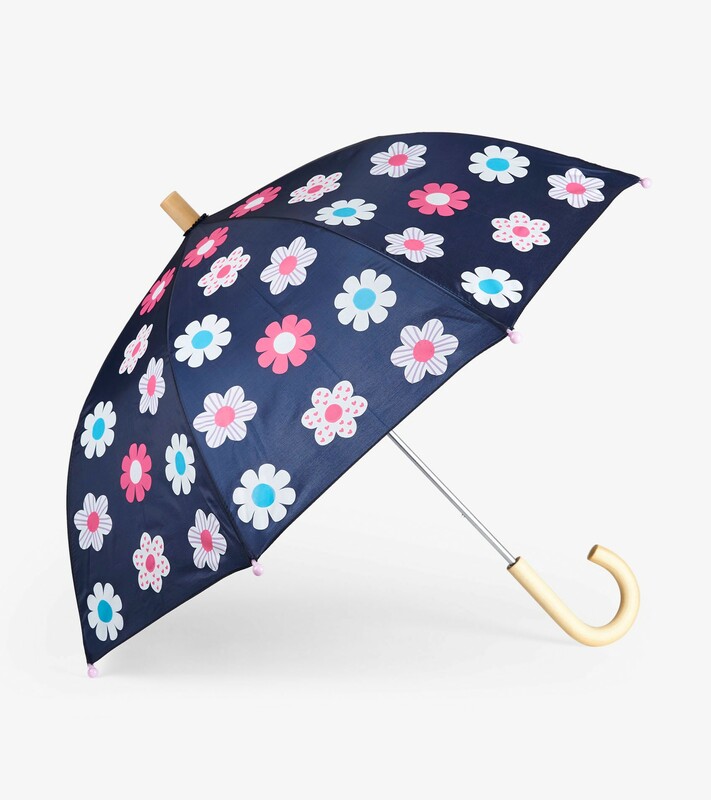 This nylon umbrella is printed with polka dot and a floral graphic. The edge if the umbrella is adorned with ruffles. This umbrella is PERFECTLY sized to make it easy for little hands to open and close on their own. This umbrella is made from polyester and is 22.5″ length. Another rain wear set for girls that is really sweet is the Hello Kitty Cutie Dot set. 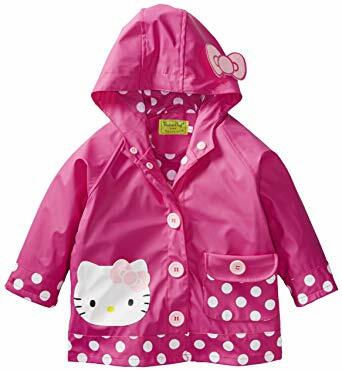 This Western Chief Hello Kitty raincoat features a waterproof outer shell plus a moisture absorbent lining. The lining is a combination of polyester and cotton. These materials are breathable allowing little ones to enjoy all kinds of play while remaining warm and dry. This raincoat has long-sleeves and features front-snap closures. This rain coat also has an attached hood to keep her protected from the elements when it is raining outside. Western Chief also makes matching Hello Kitty Waterproof character rain boots to go with this raincoat. 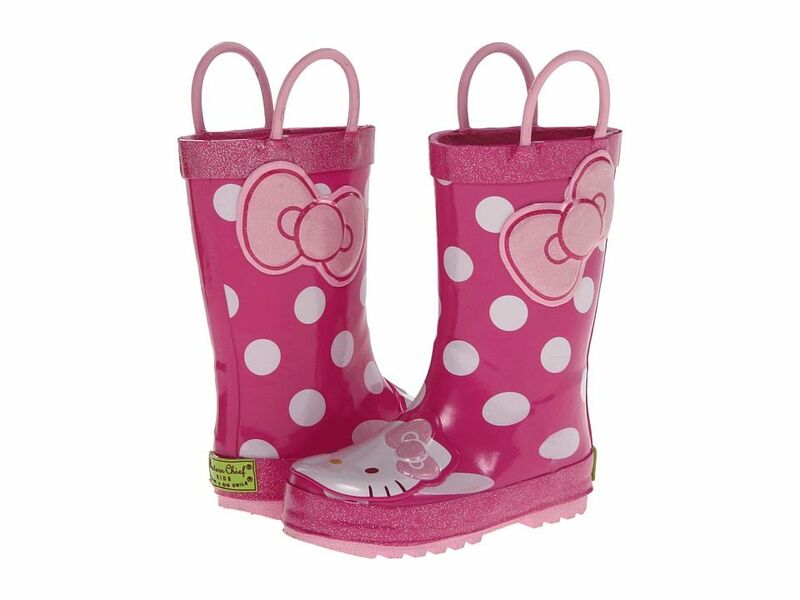 These Western Chief Kitty rain boots feature a rubber upper with allover polka dots and an adorable Hello Kitty® print. Two handles on either side of the rain boots make it easy for kids to pull them on and off. A breathable textile lining and a cushioned textile insole allow for a comfortable all-day fit. The rubber outsole is lightly treaded to keep her steady on her feet in wet conditions. These Hello Kitty rain boots also feature glitter trim at midsole and the top line of the boot. 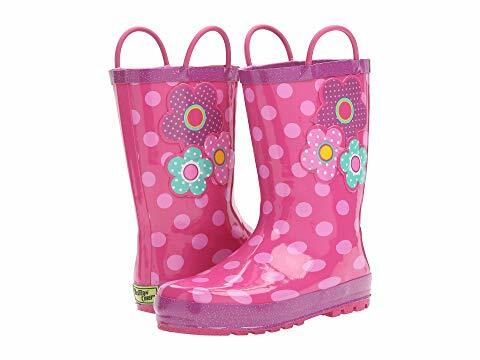 These rain boots are SUPER cute and if your child is Hello Kitty fan then she will adore them. To go with the Hello Kitty raincoat and boots, why not get the matching umbrella for a complete set. 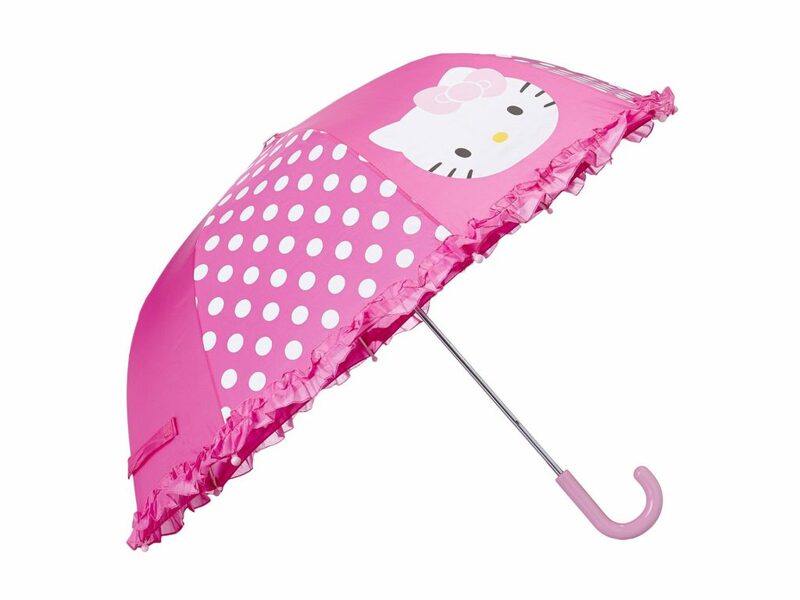 This Hello Kitty umbrella is very durable in construction and the upper is printed with Hello Kitty® graphic. This umbrella is perfectly sized to make it easy for little hands to open and close on their own. This durable nylon umbrella will keep the rain away and spread happiness on a rainy day! Another matching raincoat, umbrella and boot set that is absolutely adorable for girls is the Minnie Mouse rainwear set. 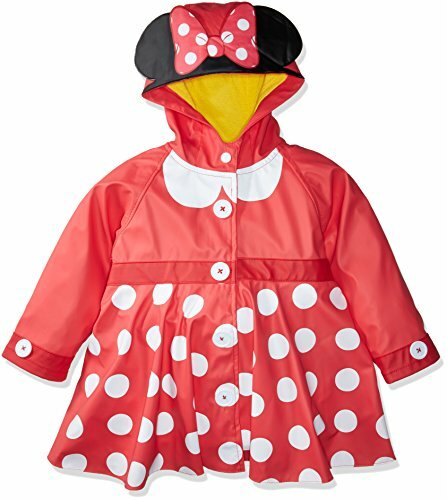 This Minnie Mouse raincoat for girls is great for rainy days and pretend play. This raincoat features a waterproof polyurethane outer shell with a a moisture absorbent lining. The lining is 65 percent polyester and 35 percent cotton and is soft to the touch. This coat also features a snap closure which makes it easier for small children to do up their own jackets. This Minnie Mouse rain coat does come with matching Disney character boots. These Minnie Mouse rain boots for girls are SO cute. These boots feature a waterproof rubber upper with a soft to the touch moisture absorbent polyester/cotton lining. These boots have easy on and off pull handles so kids can put on their own boots! This boot also has a removable eva insole that is designed to keep your child’s foot comfortable. The outsole is slip resistant to provide traction on slippery surfaces and keep her steady on her feet. These boots are very durable but also flexible and lightweight on the feet. If your child is a Minnie Mouse fan, then she will LOVE wearing this Minnie Mouse set. This rainwear set would not be complete without the matching Minnie Mouse character umbrella. 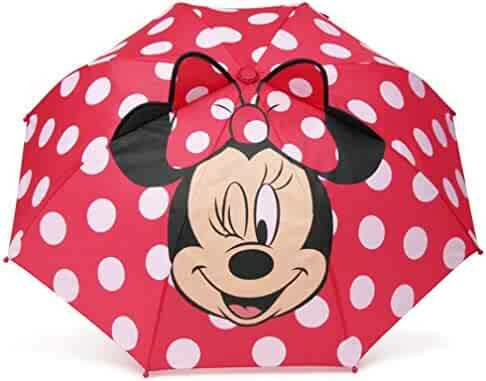 This Minnie Mouse character umbrella for kids features a fold closure and is very lightweight in construction. This umbrella is made from 100% polyester. It features a plastic inner frame and handle. This umbrella is perfectly sized to make it easy for little hands to open and close on their own. Another rainwear set that is very popular with girls is Western Chief’s Ariel raincoat with matching boots and umbrella. This Western Chief raincoat for girls features a water-resistant polyurethane shell with a warm jersey and cotton lining to keep her comfortable and warm. 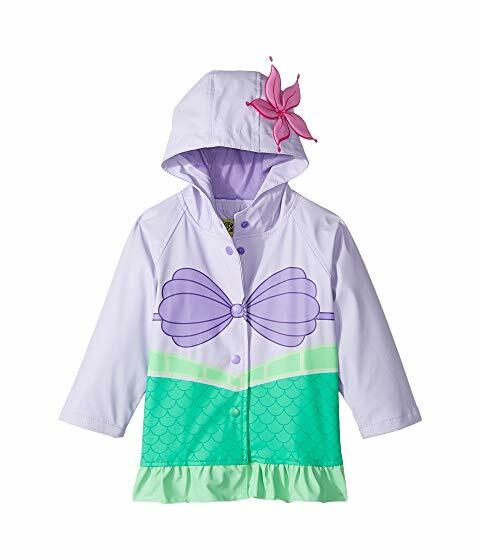 This Disney® Little Mermaid™character raincoat has a lot of detail to it with its 3D floral applique at fixed hood and the ruffled hemline for seaweed detail. It also features snap closures down the front of the raincoat to protect her from the elements. Little girls LOVE wearing this raincoat for rain and play. 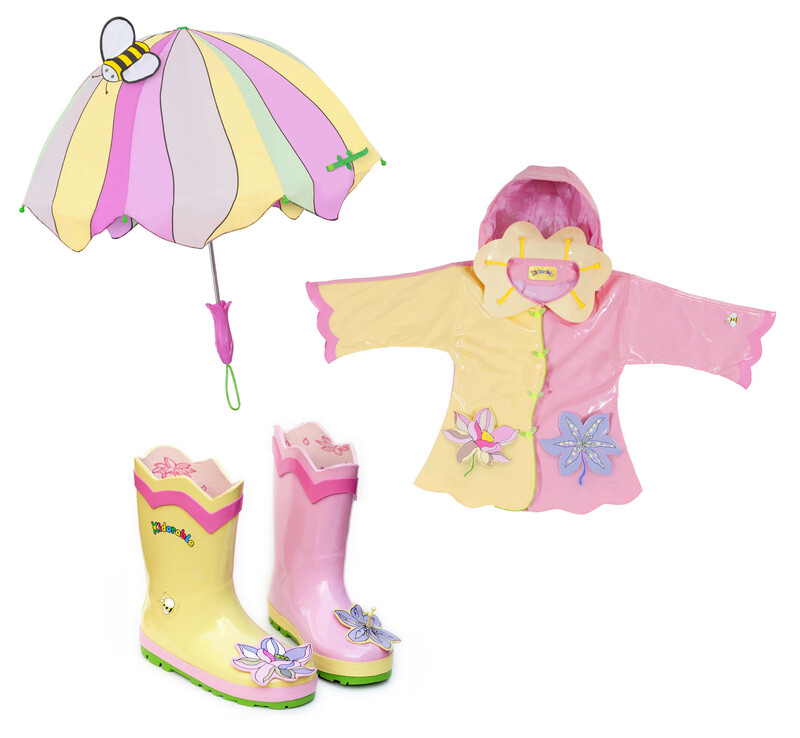 This raincoat comes with matching boots and umbrella for a CUTE rain wear set. 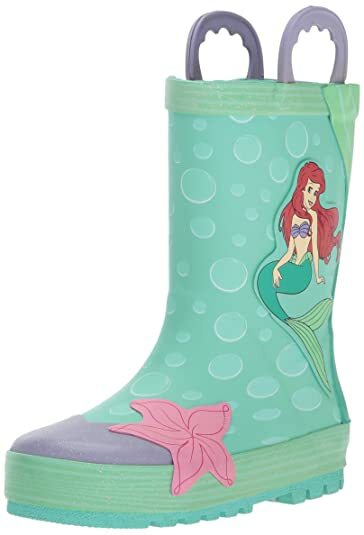 These Western chief rain boots for toddler girls with the Ariel™ and sea details throughout are an all-natural rubber boot with a lightly treaded rubber outsole that is slip resistant. The two handles on either side of the boots makes it easy for toddlers to pull them on and off all by themselves! The moisture-absorbant cotton lining inside the boots, helps keep toddlers’ feet warm and dry. 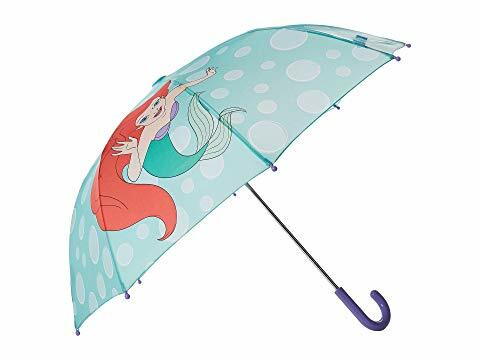 This Western Chief Ariel umbrella with the Disney® The Little Mermaid™ print on it is made from nylon and is perfectly sized for little hands to make it easy for small children to open and close on their own. This umbrella will brighten up any child’s rainy day and will also come in handy for imaginative play. 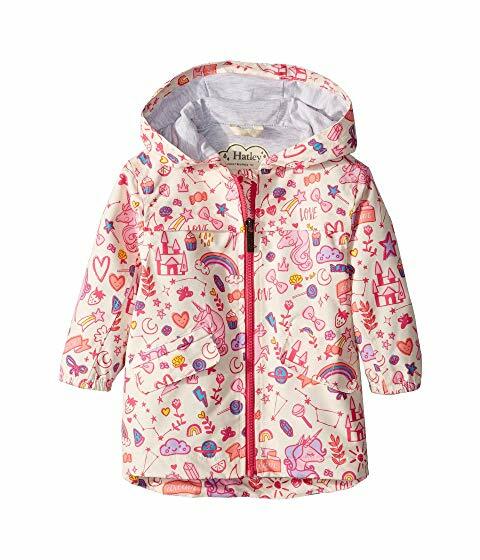 This cute raincoat by Hatley in Navy/Pink with multi-hearts combines playful style and functionality. This lightweight raincoat is designed to keep your little one dry and warm on rainy cool days. This rain jacket is lined to keep them warm and comfortable and it features two pockets for storing treasures and five buttons down the front. The outer shell is 100% polyurethane while the lining is made of 100% polyester. This Hatley raincoat comes with matching boots and an umbrella for a complete set. 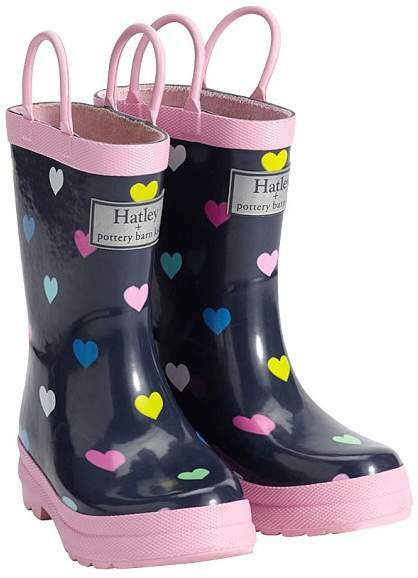 Hatley Navy Pink Multi Hearts rain boots are very durable in construction and designed for jumping into puddles. Made from pure rubber, the handles on these boots make it easy for children to pull the boots on and off. The super soft lining will keep kids’ feet warm and dry. These rain boots also feature a removable insole with a non-slip sole which is PVC free. They are combine a playful style while maintaining functionality. This rainwear set also comes with a matching umbrella if you are looking for a complete set for your child. 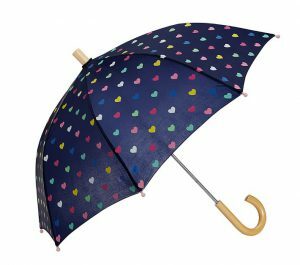 The Hatley Navy Pink multi-hearts umbrella features a metal frame with a wooden handle. Its lightweight metal frame makes it easy for kids to carry. This umbrella is durable in construction and is designed to keep kids dry. It is also fade resistant. Another rain wear set for girls by Hatley is called Pink Tortuga Bay Floral which comes in a matching raincoat, boots and umbrella. This Hatley raincoat for girls in ‘Aqua’ will keep your toddler warm and dry so she can splash the day away. This rain coat features water-resistant fabrication and an adorable galloping horse print that changes colors in the rain. How COOL is that? This raincoat has a cozy terry lining throughout and an attached hood. It has a snap front closure and front snap pockets. An inside hanging loop will come in handy for hanging this raincoat up after a rain storm. This color changing raincoat comes with matching boots and an umbrella for a complete rain wear set. 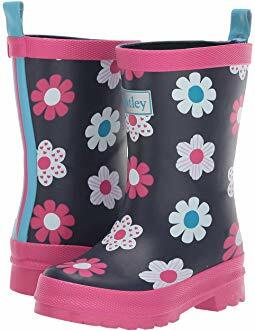 These Hatley rain boots for girls in ‘Flower Sketches’ are SO cute and will keep your child’s feet warm and dry as she does some serious puddle jumping. These rain boots are waterproof with an allover FUN print that is the perfect way for ushering in spring and rain showers. They have a 100% cotton lining and slip resistant outsoles to keep her steady on her feet. These boots are also PVC-free. This Hatley umbrella for girls features a fun print every kiddo is sure to love. This color changing umbrella changes colors in the rain. Durable polyester material withstands the elements on rainy days. 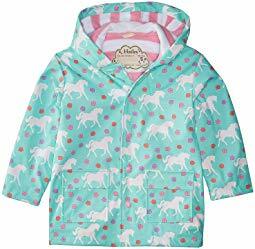 This cute rain jacket for girls is adorned with a unicorn doodle pattern print. This jacket is made from water-resistant polyurethane and is lined throughout. This breathable microfibre jacket has a jersey lined hood to help protect her from the elements. This jacket also has a zipper closure down the front and front snap pockets. There is also an inner identification label at back for writing your child’s name. This rain jacket comes with matching boots and an umbrella for a complete set. 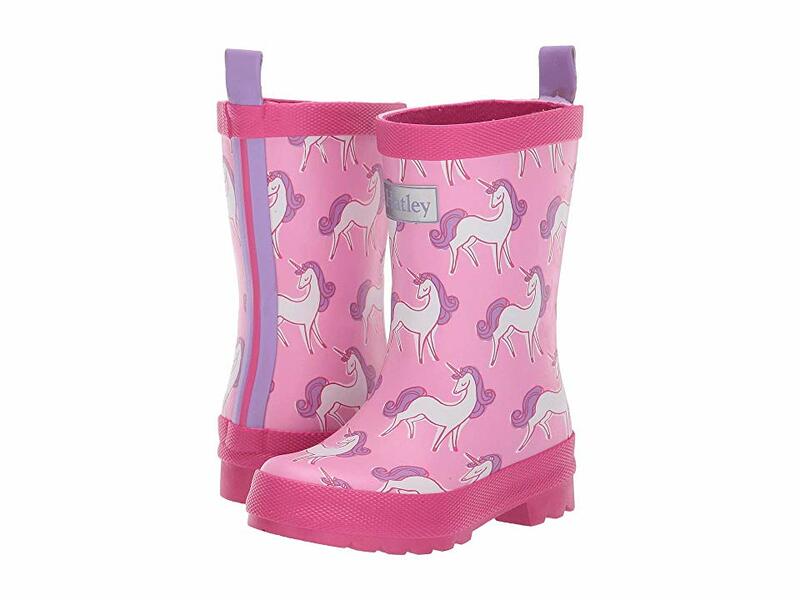 These pretty slip-on unicorn rain boots are the perfect addition for keeping your little adventurer warm and dry as she plays in the rain with her friends. These waterproof rain boots are made from vulcanized rubber with a 100% cotton lining. These boots are PVC-free and they have a removable insole. They also feature slip-resistant outsoles to keep her steady on her feet. To go with the rainbow rain jacket and matching boots, why not get the umbrella for a complete set. 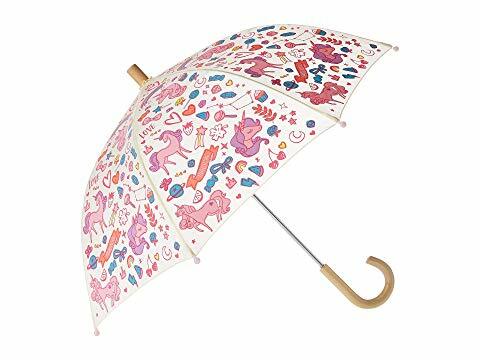 This kid-friendly unicorn doodles umbrella is just the accessory she needs as she ventures outside in the pouring rain. 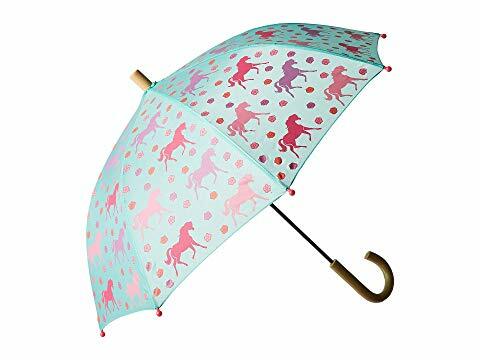 This cute unicorn umbrella features a wooden handle and a kid-safe design for little hands to open and close on their own. This umbrella is constructed from durable polyester material that can withstands the elements. 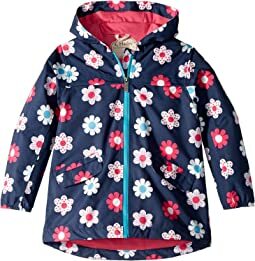 This Hatley Kids Spring Flowers raincoat is designed with FUN flowers for spring to protect your child from rainy days in style with this smart raincoat. This floral-printed rain jacket is made from a water-resistant polyurethane and is lined throughout. It also has a jersey lined hood. The design also includes a zipper closure down the front and front snap pockets for storing treasures. 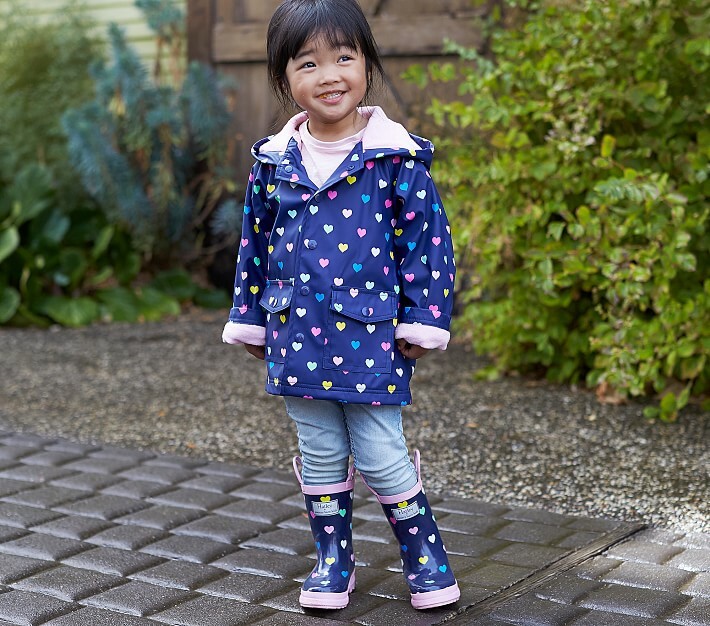 Team this beautiful raincoat with matching rain boots by Hatley for the perfect puddle-ready outfit. 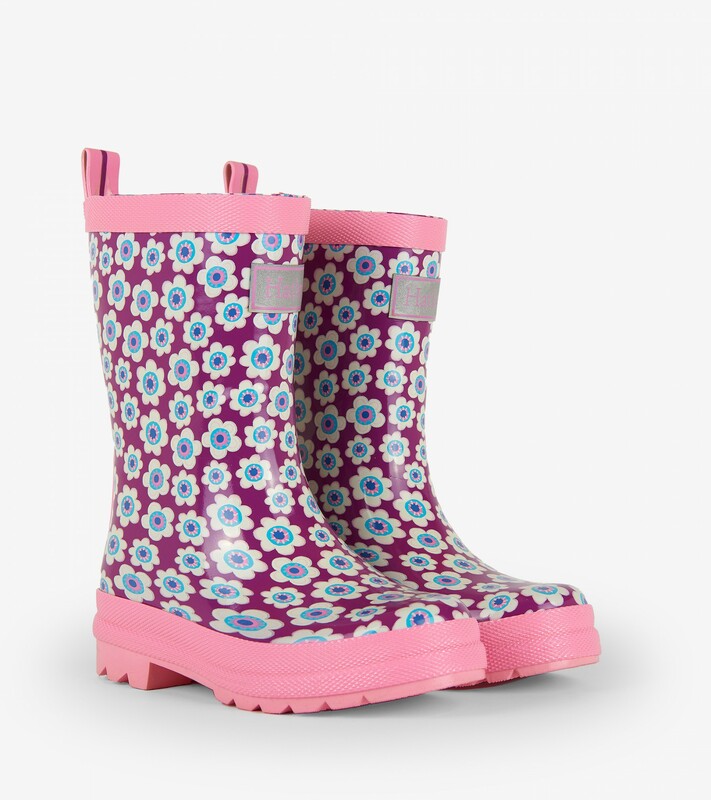 These rain boots for girls with the flower print are a smart way to ensure dry feet and endless adventures for your child on overcast days. This classic design features a waterproof constuction with a cotton breathable lining. These rubber boots have a pull tab at the back to make it easier for little ones to get their boots on and off . There is a removable insole with a slip-resistant outsole to keep her steady on her feet. These boots are also PVC-free. This Hatley kids umbrella with the ‘Spring Flowers’ print features a child-friendly release and Velcro strap for storing away. This umbrella has safe, rounded tips and a child-sized handle to make it easy for small children to hold. This umbrella is also perfectly sized to make it easy for little hands to open and close on their own. It is made out of polyester and it measures 23 inches long by 28 inches open. This cheerful Buttrflies & Buds print raincoat is waterproof and PVC-free. It is fully lined with teddy fleece and includes snap button closures down the front. This raincoat also features spacious pockets and an attached hood to keep her head protected from the elements. 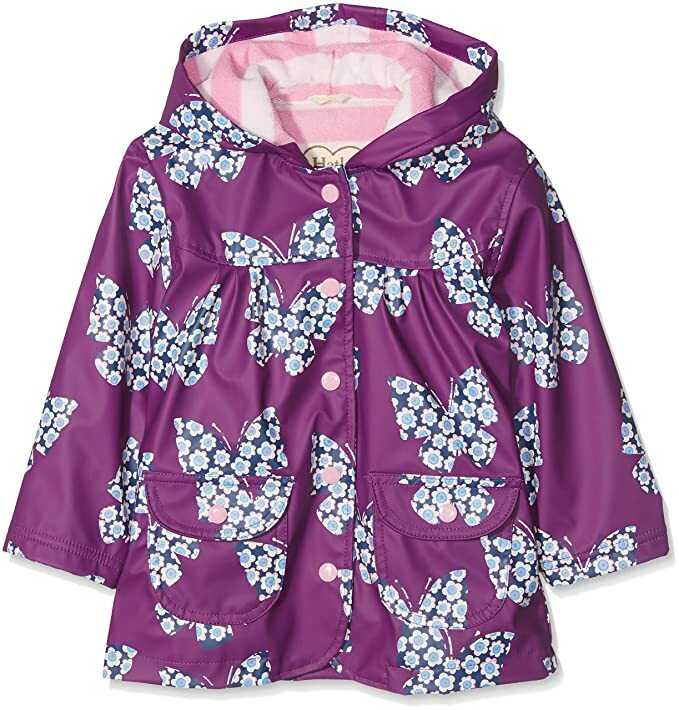 This Hatley Purple Butterfly raincoat is very stylish and cozy to wear and is the perfect wet-weather option. Team this raincoat with the brand’s colorful rain boots for the perfect puddle-ready outfit. 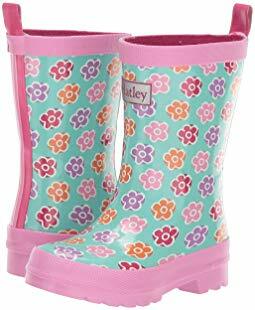 These Hatley Girls rain boots in ‘Butterflies and Buds’ features a non-slip sole that will help keep her safe as she jumps from puddle to puddle. They are waterproof and very sturdy. These rain boots will come in handy for spring, summer and fall weather. 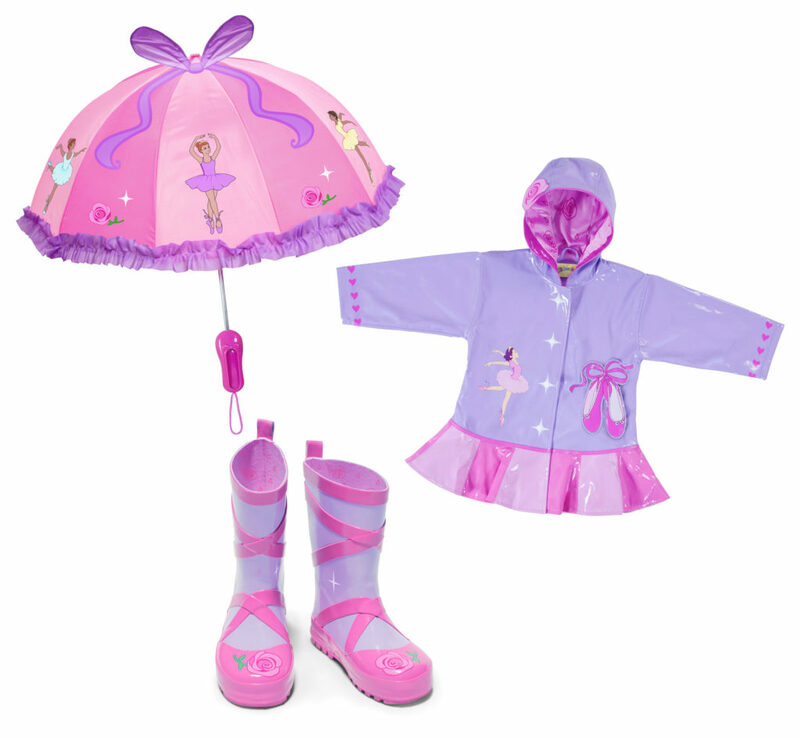 This Ballerina rain wear set comes with a matching raincoat, boots and a matching umbrella. The raincoat is made from a premium quality PU with a lightweight, comfy printed nylon lining that can be worn every day, all spring, summer and into fall. The rain boots are made from a natural rubber with a FUN, printed cotton lining and non-slip sole. The umbrella is lightweight in construction and child-safe. It is perfectly sized for little hands, with a FUN, easy to grip Ballerina Pointe shoe handle for extra play value. This rain wear set is absolutely adorable and will be a BIG hit with your child. Another rainwear set that is REALLY CUTE is Kidorable’s Mermaid rainwear set. 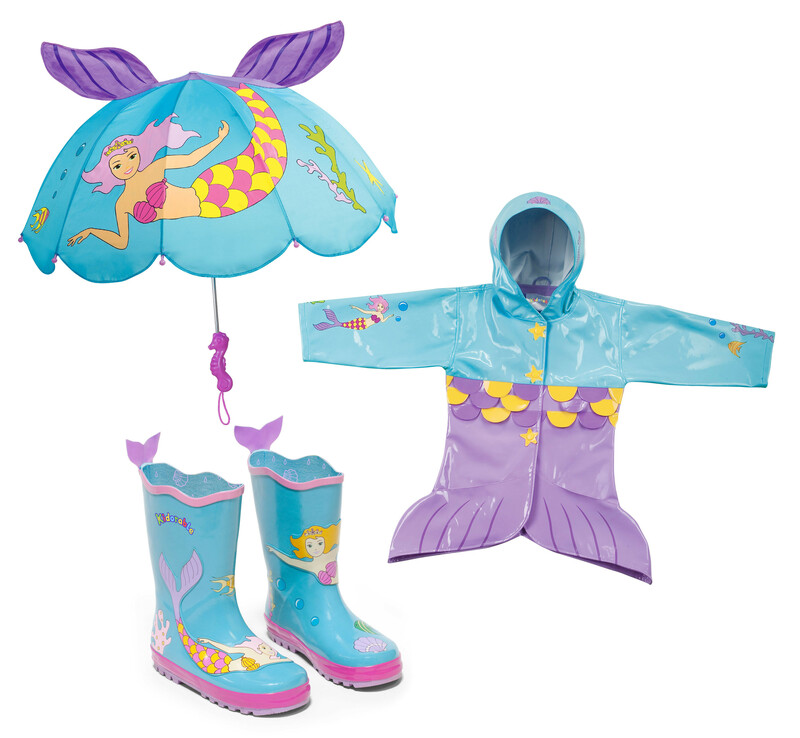 This Kidorable Mermaid rainwear set features a matching raincoat, boots and umbrella. The coat is constructed from premium quality PU with a lightweight and comfy printed nylon lining. This rainwear set could be worn during the spring, summer and fall season. The boots are made from a natural rubber with a fun, printed cotton lining and non-slip sole. The umbrella is lightweight in construction and child-safe. It is perfectly sized for little hands, with a fun, easy to grip Mermaid handle which adds extra play value. 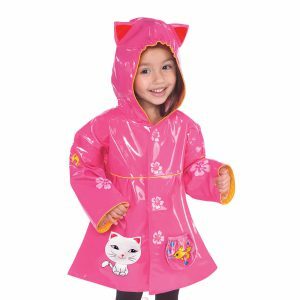 The Lucky Cat raincoat from Kidorable is much more than just a raincoat for a little girl. This rain coat can be worn in the spring, summer and into the fall. 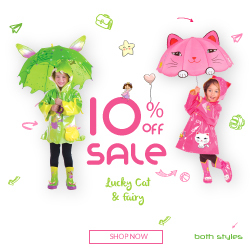 This rain coat features Fun Lucky Cat pocket, a 2nd fish bowl pocket, flower buttons and cute kitty ears. It is made from premium quality PU with a lightweight, comfy printed nylon lining. This jacket comes with matching boot, umbrella and an umbrella for a complete set. 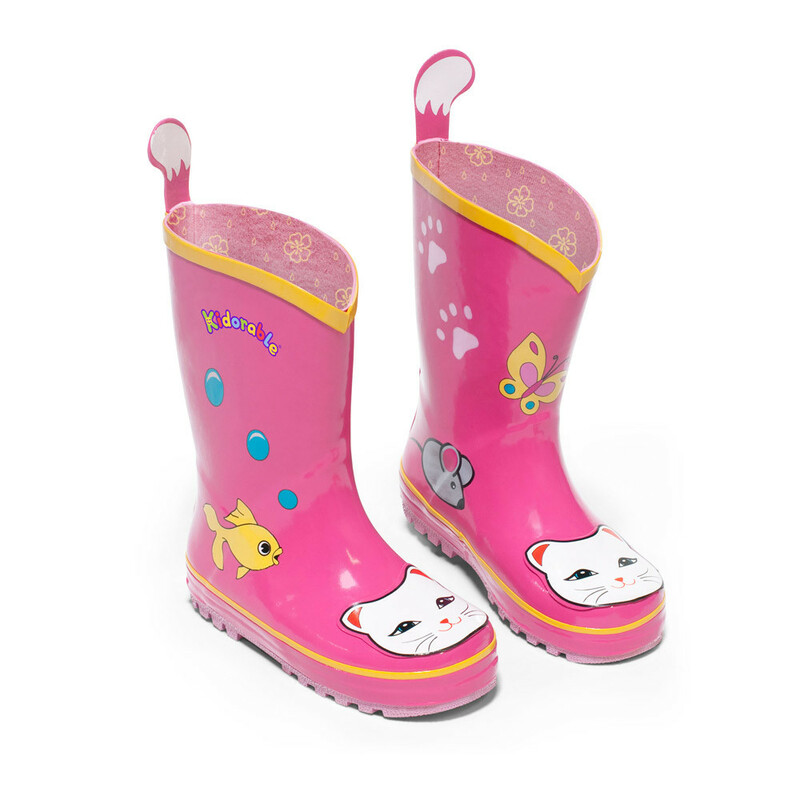 The Lucky Cat rain boots feature a cat theme design with a Fun, printed cotton lining and non-slip sole. These rain boots are EASY to pull on with the cat tail heel tabs at the back opening of the boots. If your child LOVES cats then she will be head-over-heals for these boots. If you want a complete set there is also an umbrella to go with this rain set. The Lucky Cat umbrella is lightweight, child-safe nylon umbrella. 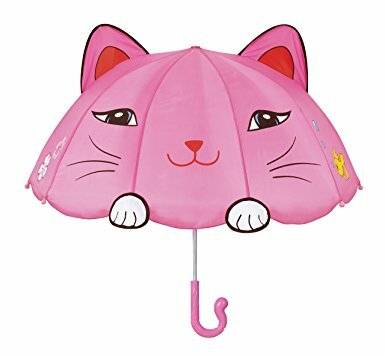 This umbrella has a FUN easy to grip Lucky Cat tail handle for smaller hands to handle. It also offers extra play value. It is child-sized for those little hands (measures 24″ long and 27″ diameter open). A Velcro strap offers quick storage when you want to close and put this umbrella away. Get the complete Lucky Cat Rainwear Set Here. 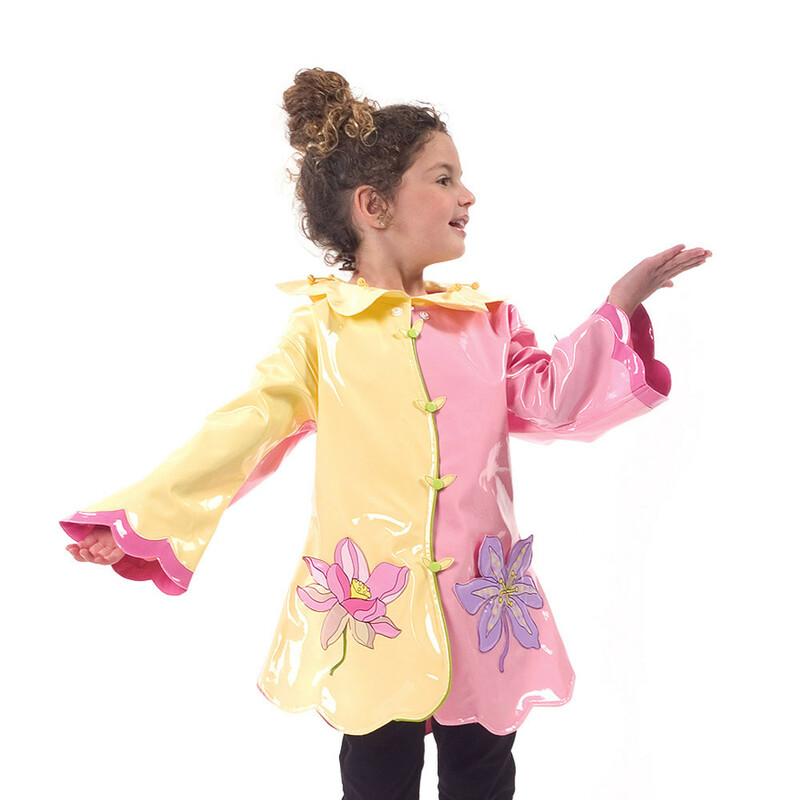 This adorable Lotus Flower rain coat features two FUN lotus pockets with flower petal buttons and neck. It is made from premium quality PU with a lightweight, comfy printed nylon lining. This irresistible, eye-catching stylish rain coat can be worn in spring, summer or fall. This coat is machine washable and it comes with a free Kidorable hanger. This rain coat is the perfect design for ushering in spring. To go with this rain coat are matching Lotus flower rain boots. 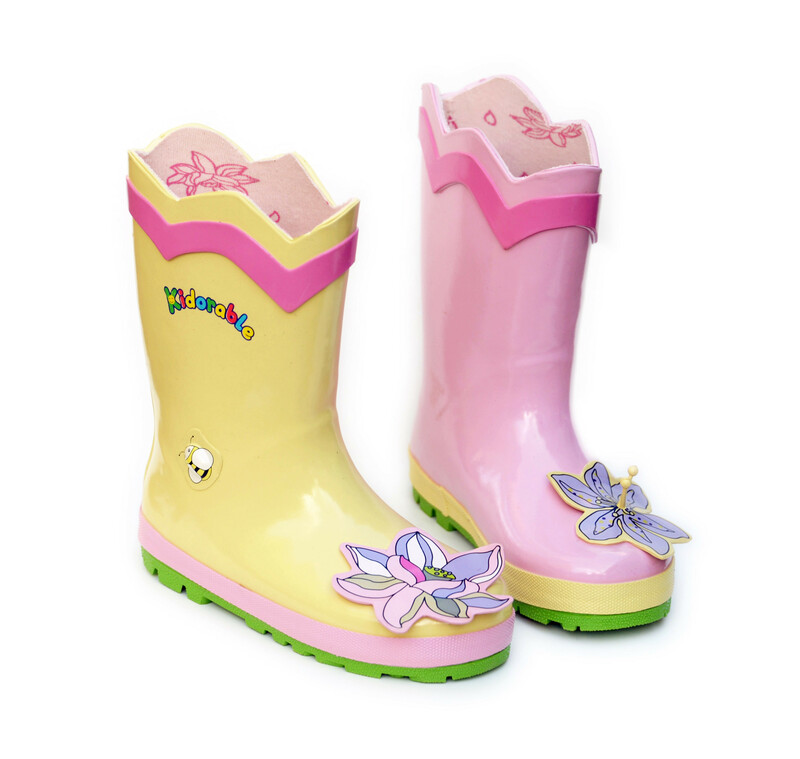 These Kidorable Pink and Yellow Lotus Flower Rubber rain boots are adorable with their light pink and yellow colors and the three dimensional lotus flower on the toe of the boots. These natural rubber rain boots feature a FUN, printed cotton lining and non-slip sole to keep her steady on her feet when she encounter wet surfaces. These boots are easy for small children to pull on. This rain wear set also comes with a matching Lotus umbrella for a complete set. 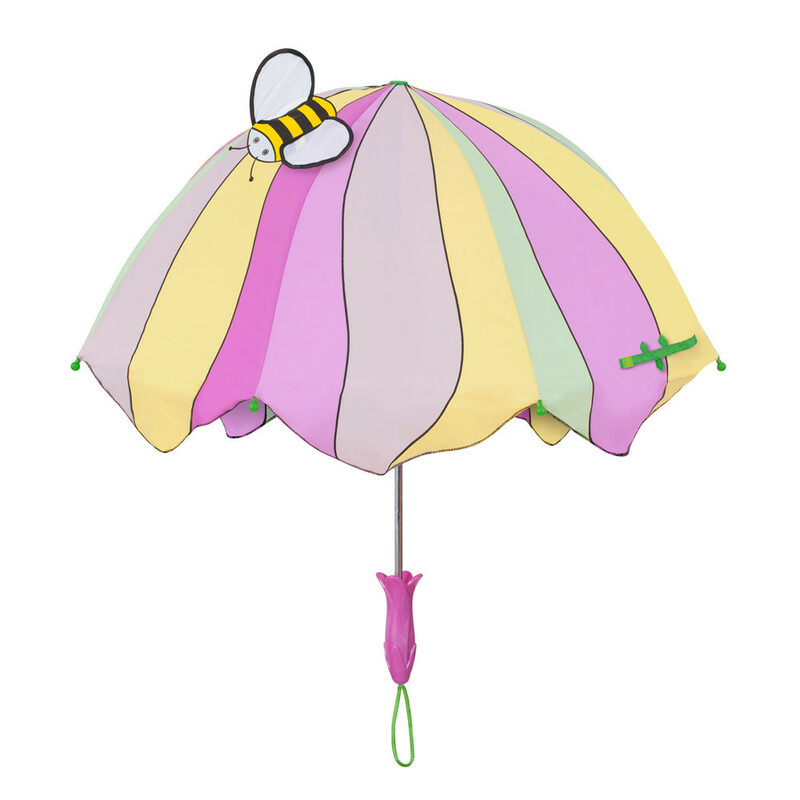 This Lotus Flower umbrella from Kidorable is lightweight and child-safe in construction. A Velcro strap allows for quick storage and the Fun, easy to grip lotus handle add extra play value to this umbrella. This adorable umbrella is child-sized for those little hands (measures 24″ long and 27″ diameter open). You can buy these rain wear pieces individually, or you can get the complete Lotus Flower Rainwear Set here. Kidorable also makes some really cute rain wear sets for boys like the Dinosaur and Fireman and Dragon Knight rain wear sets. 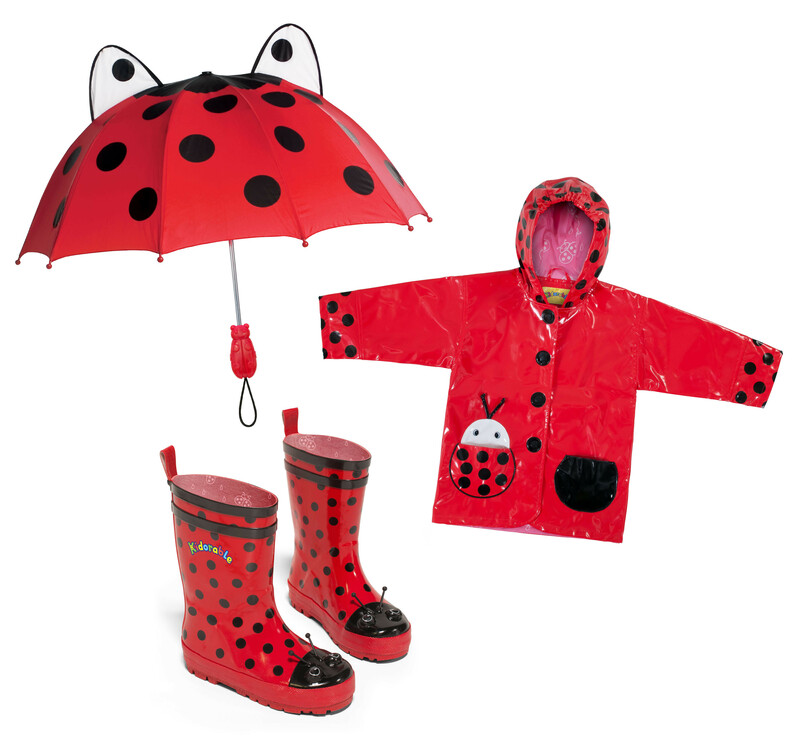 This Kidorable Ladybug rainwear set comes with a matching raincoat, boots and umbrella. The coat is made from premium quality PU with a lightweight, comfy printed nylon lining for added comfort. This raincoat can be worn in the spring, summer and into the fall season. The boots are made from a natural rubber with a fun, printed cotton lining and a non-slip sole. The umbrella is lightweight in construction and child-safe. It is perfectly-sized for little hands to carry and it also has a FUN and easy to grip ladybug handle for added play value. If your child is fascinated with ladybugs, then she will look as cute as a bug in this rain wear set. This Kidorable Dinosaur rain coat has an irresistible and eye-catching design that any little boy will LOVE. It is made from premium quality PU with a lightweight, comfortable printed nylon lining. It comes with a free Kidorable hanger. It also features easy snap button down the front of the rain coat that kids can do up all by themselves. This rain coat is not only adorable on but it is also very functional. It can be worn during the spring, summer and fall season on those rainy days. If you kiddo loves dinosaurs and want to pretend to be one, then this rain coat will help spark his imagination and transport him to the dinosaur age. One parent wrote a wonderful review of this product. You can read her testimony here. This dinosaur rain coat also comes with matching boots and an umbrella. 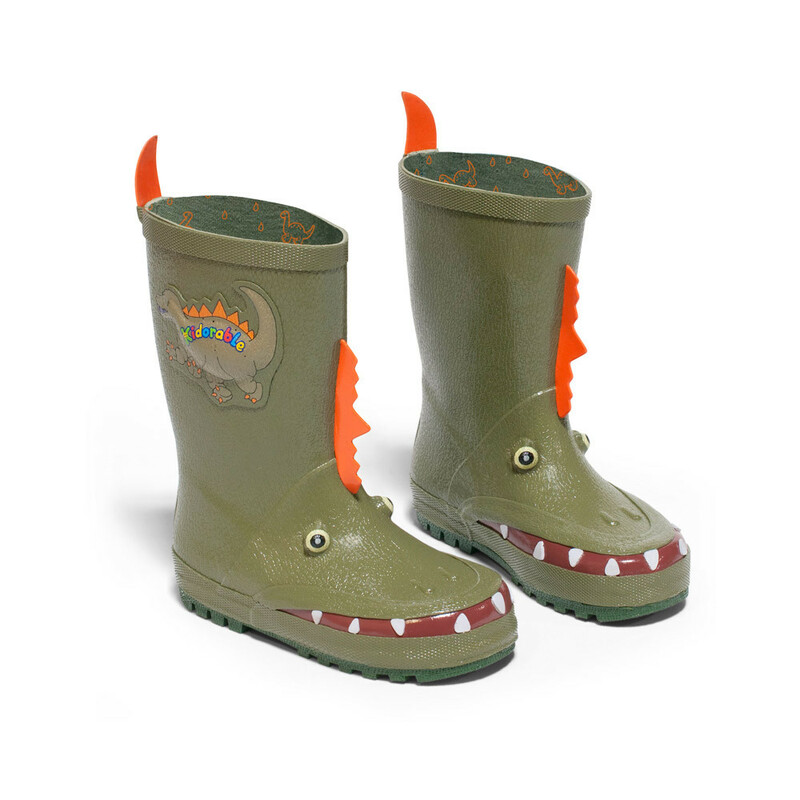 These dinosaur rain boots by Kidorable are full of FUN dino features like –spikes, teeth, scaly skin, plus easy to pull on with Dino-spike heel tabs at the top of the boot. Made from natural rubber, these boots also feature a FUN printed cotton lining and non-slip sole to keep your little guy steady on his feet. This dinosaur rain set also comes with a matching umbrella. 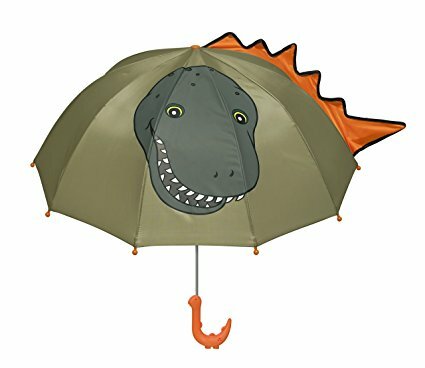 This dinosaur umbrella is a lightweight, child-safe nylon umbrella which is the perfect size for smaller hands. The fun, easy to grip Dinosaur handle adds extra play value, plus a spiky 3-D pop-up Dinosaur tail which is sure to spark your child’s imagination and creative play. This umbrella is child-sized for those little hands (measures 24″ long and 27″ diameter open). If you are interested in a complete rain set for your child, you can get the complete dinosaur rain set here. 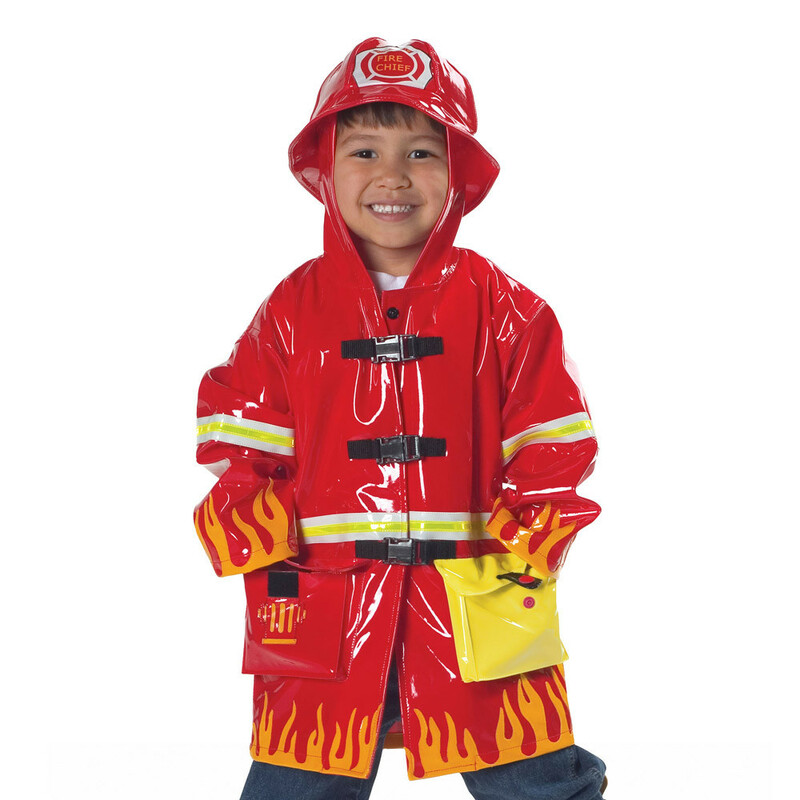 If your child has dreams of becoming a fireman some day then the Fireman rain coat is a rain coat he will like. 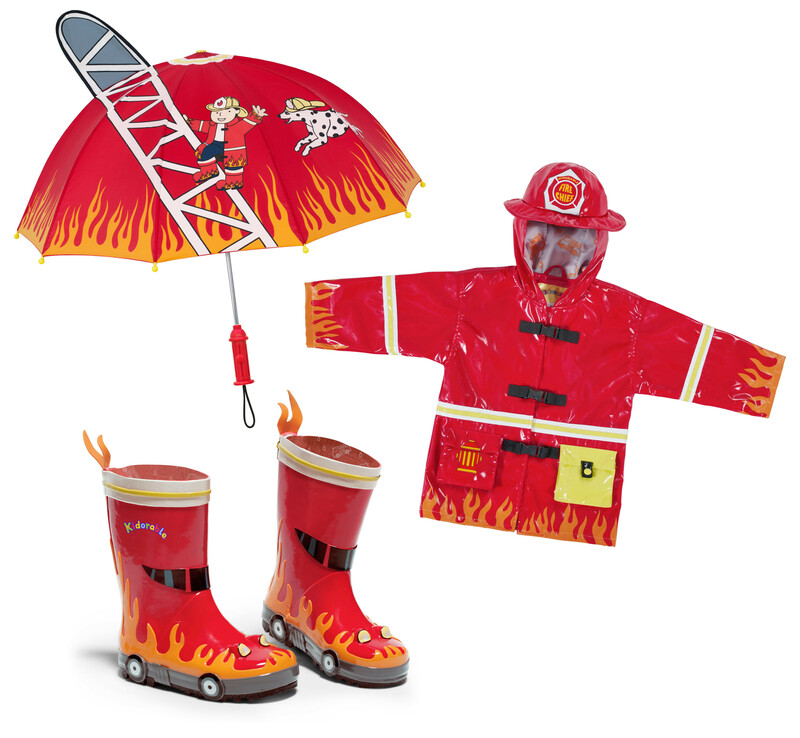 This Kidorable Fireman rain coat is made from premium quality PU with a lightweight, comfy printed nylon lining. This rain coat is made from premium quality PU with a lightweight, comfy printed nylon lining. This rain coat also features two Fun Fireman pockets for extra play value, plus a Fireman helmet. How cool is that. For your little hero this rain jacket will be super cool to wear on rainy days. This rain coat also comes with a free Kidorable hanger. 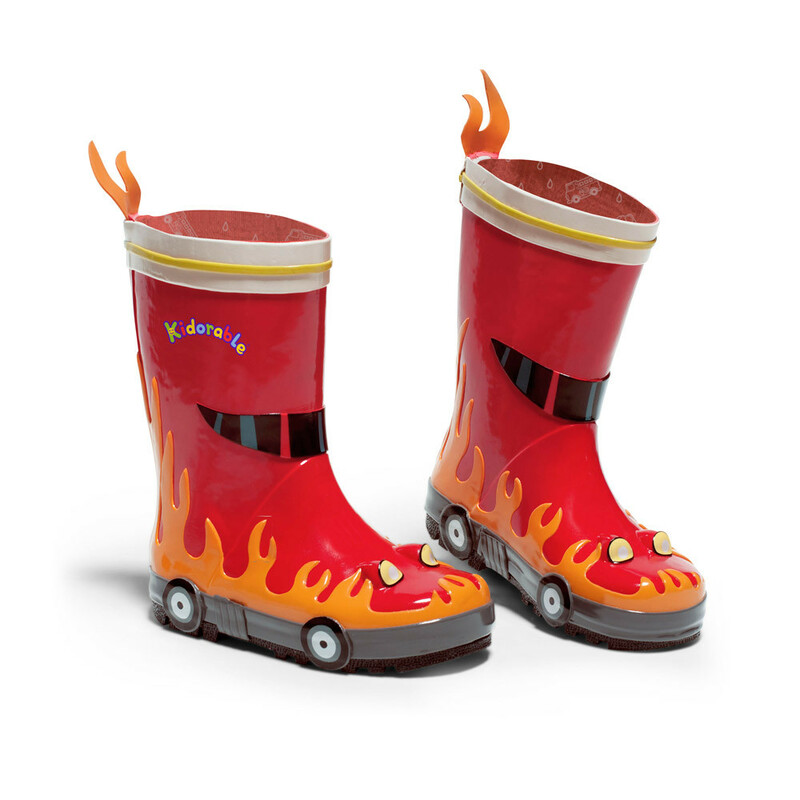 To go with this Fireman rain coat why not get the matching Fireman Rain boots. These Kidorable rain boots are made from natural rubber and are full of FUN features –wheels, flames, headlights, windows, plus an easy to pull on flame heel tab to make it easier to pull these boots on and take them off. These boots also feature a printed cotton lining for added comfort and non-slip sole to keep your little guy steady on this feet. They are adorable and will look great with the matching rain coat. Get ready for some serious puddle jumping with these rain boots. This rain wear set also comes with a matching umbrella to keep your child protected from the elements. 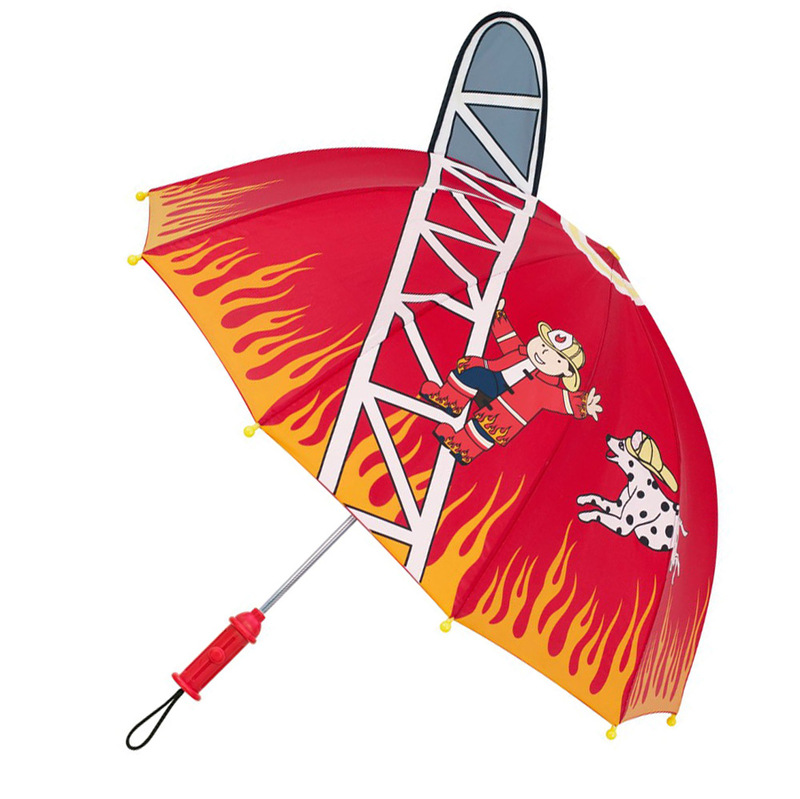 The Kidorable Fireman umbrella is a child-safe and lightweight in construction. This umbrella is made out of nylon with a fun, easy to grip Fire hydrant handle for extra play value. A velcro strap provides quick storage when you want to put this umbrella away. Read what other parents have to say about this umbrella by reading reviews here. You can get the complete Fireman Rainwear Set Here. Another rain wear set that boys really like is called the Dragon Knight rain wear set. If your child likes pretending to be a knight and fighting dragons then this is the rain wear set for him. 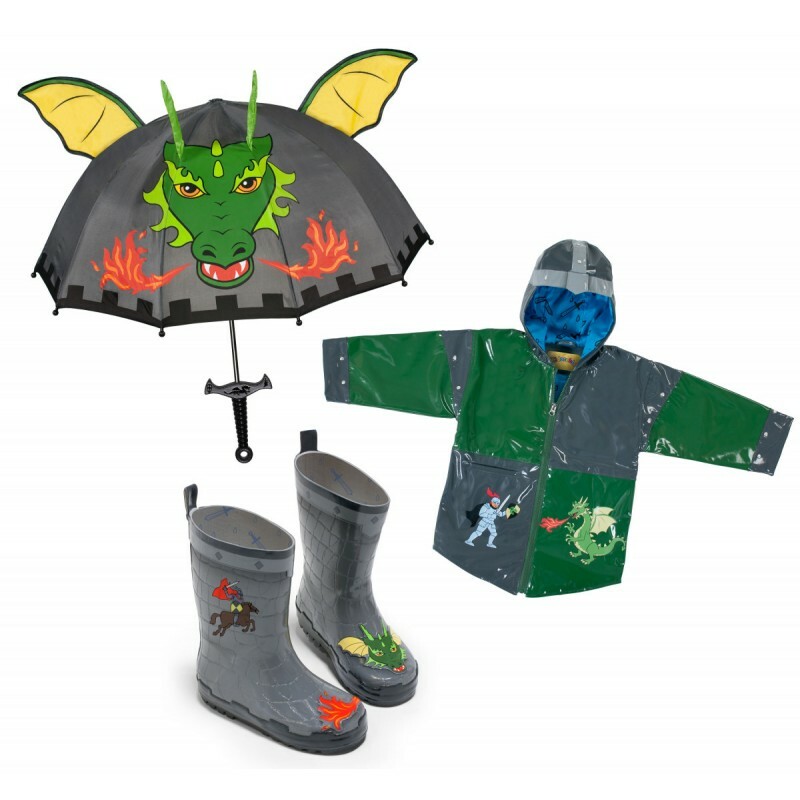 This Kidorable Dragon Knight rain wear set comes with a matching dragon knight raincoat, boots and umbrella. The raincoat is made from premium quality PU with a lightweight, comfy printed nylon lining. This raincoat can be worn in the spring, summer and into the fall season. The boots are all natural rubber with a fun, printed cotton lining and non-slip sole. The umbrella is lightweight in construction and is designed to be child-safe for little hands. This umbrella features an easy to grip Dragon Knight sword handle for extra play value.